So the president of the United States has ordered the Attorney General to go after the speculators who have been drive up the price of oil and therefore gas. What can I say about this? Does the President think the American people are stupid? No one is going to fall for this line of crap. Up front, let me acknowledge my guilt in this matter. I’m a speculator. I try my best at it. Some of my best friends are speculators. Many of my readers are speculators. In one-way or the other we are all speculators. Those that don’t think they speculate are actually speculators. My local oil delivery company let’s me play in the big casino. I bought an option at a fixed price for 5,000 gallons of heating oil. The premium for the option was 20 cents a gallon. So I paid them $1,000 cash. That was sort of gambling money. If the cash price were to fall I’d get the lower price. If it rises, my cost is locked in. Last I looked I was 70 cents in the money. My option cost was 20 cents so I’m “up” 50 cents on 5,000. That’s $2,500 so I’m feeling good on this spec. It’s not hard to find ways to make money in a rising energy market. I don’t have the balls to trade Brent futures. I overweight energy names in the global stock market. It’s worked pretty well. I have some investments with funds that do trade energy futures (a “macro” directional fund). They’ve been doing great. I have nothing to do with their market bets, but since I (and many others) provide the equity I have to take some responsibility for their actions. So if the AG is looking for someone who’s hands are “dirty”, well, I guess I’m on the list. If he did look me up, I would tell him that it was the Ben Bernanke that told me to do it. If the Justice Department wants to lean on me they also have to lean on the Fed. Monetary policy also has an important influence on inflation. When the federal funds rate is reduced, the resulting stronger demand tends to push wages and other costs higher. Interest rates will be kept exceptionally low for an extended period of time. To me, this is pretty clear, hopefully Holder will agree. The Fed has succeeded in its effort to change my expectations of the future of my energy costs. With my expectations being influenced, it is only natural that I would react. When I pay $1,000 to lock in a price to heat my home it is exactly what Bernanke would want me to do. I’m the best evidence that he has that his policy is “working”. Bingo! The desired consequence of the Fed’s monetary policy is to devalue the dollar in order to increase economic activity. But that same action also results in higher imported prices for crude. The only conclusion that I can come to is that higher oil prices are the desired consequence of Fed policy. Bernanke has brought me to the water and strongly suggested I should drink some. It’s all spelled out in the FAQs. Its not hidden in some obscure language. Shame on me (and the President) if I had ignored such an obvious outcome. The President and the AG need to determine why folks like me are speculating rather than just blaming me for high prices. 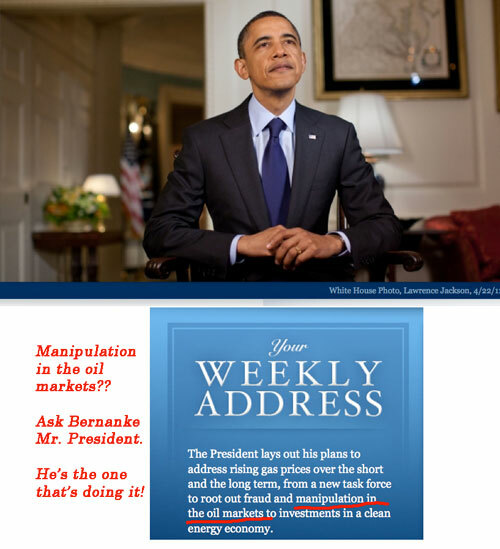 When they look at the facts they can’t help but see that it is Bernanke that’s behind all that high priced gas. The speculators like me are just the mechanism that Bernanke uses to achieve his ends. Bruce worked on Wall Street for twenty five years, he has been writing for the professional press for the last five years and has been on the Fox Business channel several times as a guest describing his written work. From 1990-1995 he ran a private hedge fund in Greenwich Ct. called Falconer Limited. Investments were driven by macro developments. He closed the fund and retired in 1995. Bruce also been employed by Drexel Burnham Lambert, Citicorp, Credit Suisse and Irving Trust Corp.
Bruce holds a bachelor's degree in economics from Ithaca College and currently lives in Westchester, NY. Interesting article. Thank you for posting it. Regarding speculation – as an economic behavior, mind you – it is something that is probably best minimized in any economy. That is because the more rampant speculation is, the more easily it introduces volatility and bubbles into the market, which in turn generate additional fear of the future, which in turns encourages more speculation. Please think about how that feed-forward process works. I would not say that speculation should be eradicated, as it serves a very useful purpose when used in a restricted manner, but when everyone begins to treat it as a quick way to earn $1K without doing any labor, it only feeds into the worst of human instincts – laziness, greed and fear. Sure, monetary policy is partly if not almost entirely to blame for the current dip in the dollar and the rise of oil prices, but that doesn’t mean speculation of the sort of you describe is okay. If you need that extra $1K to pay your energy bills (and if you can’t cut back), it would be better for all of us if you chose some other behavior to get that extra money than to sit at a console and input numbers. Please think about that, and perhaps you won’t be so selfish in the future, and the future won’t appear so uncertain. Anyone who makes decisions based on an assumption of the future change in price of an item is by definition a speculator. The heating oil company is speculating it can get oil cheaper in the winter, and is willing to collect money now and commit to a price in anticipation of their price estimate coming true. Seem preposterous to ban this, because it helps with the cash flow and certainty of both the company and the individual who wont have to guess if his paycheck will cover the heating bills. Essentially all economic planning of individuals and firms falls under the “speculation” umbrella when one takes into account the unknown nature of future interest rates/money supply/taxation/etc. Speculation is also a zero (or even negative) sum game – the heating oil will actually be delivered at a certain price, and one or the other will have lost a potential profit. There is little risk that we will end up in a world where “everyone begins to treat it as a quick way to earn $1K without doing any labor”, because the number of losers = number of winners. Speculation is nearly unavoidable, and in this case is likely making matters better for both parties. The only other option is to live in a world where everything is static – prices, wages, interest rates, production, consumer preferences – over all time periods. Should companies be banned from selling a product that may change value over time? Of course not. Secondly, speculation may lower volatility, as larger firms that aggregate capital can smooth fluctuations in price and profit off delivering the underlying item in a reliable way – exactly what the heating oil company is doing in this example. For the individual, this reduction in volatility is a great thing since he can plan that heating oil will cost no more than his option strike price. Are we going to eat every orange in the country in January? No, someone is going to speculate on the future price/supply/demand of OJ by purchasing and storing the product until July when the demand is higher and natural supply does not exist.